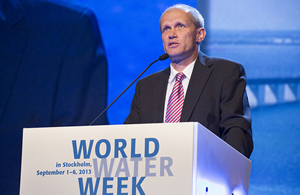 Torgny Holmgren is Executive Director of the Stockholm International Water Institute (SIWI). STOCKHOLM, Oct 30 2014 (IPS) - It demands repetition: water is a precondition for all life. It keeps us alive – literally – while being a prerequisite for or integral part of most of our daily activities. Think hospitals without water, think farms, energy producers, industries, schools and homes without our most needed resource. All sectors, without exception, are dependent on water. The 2014 World Economic Forum in Davos reported that water security is one of the most tangible and rapidly growing current global challenges. But: water is a finite resource. And along with more people entering the middle class, a growing global population, and rapid urbanisation, comes an increased demand for freshwater. More food needs to be grown, more energy needs to be produced, industries must be kept running, and more people will afford, and expect, running water and flushing toilets in their homes. Global demand for freshwater is, according to OECD, projected to grow by 55 per cent between 2000 and 2050. These demands will force us to manage water far more wisely in the future. However, how to manage water is still a luxury problem for the two billion people in the world who still lack access to clean drinking water. Without clean water you cannot safely quench your thirst, prepare food, or maintain a basic level of personal hygiene, much less consider any kind of personal or societal development. In addition to being a breeding ground for diseases and human suffering, as seen during the Ebola Virus Disease (EVD) outbreak in West Africa, a lack of water keeps girls from school and women from productive work. On a larger scale, it keeps societies and economies from developing. Stockholm International Water Institute (SIWI) is firmly advocating for a dedicated Sustainable Development Goal (SDG) on Water in the Post-2015 development agenda. A water goal needs to address several key aspects of human development. It is needed for health. By 2050, business-as-usual will mean two billion smallholder farmers, key managers and users of rainwater, eking out a living at the mercy of rainfall that is even less reliable than today due to climate change. In addition to the two billion people lacking access to safe drinking water, 2.5 billion people do not have access to improved sanitation facilities. One billion people are still forced to practice open defecation. On the positive side, every dollar invested in water and sanitation equals an average return of four dollars in increased productivity. A dedicated water goal is needed for sustainable growth. The manufacturing industry’s demand for water in the BRICS countries is expected to grow eight times between 2000 and 2050. Water scarcity and unreliability pose significant risks to all economic activity. Poorly managed water causes serious social and economic challenges, but if managed well can actually be a source of prosperity. A water goal is needed for agriculture. Today, 800 million people are undernourished. In combination with a growing population’s dietary needs, it is projected that by 2050, 60 per cent more food will be needed as compared to 2005. How to grow more food, without having access to more water, is a potent challenge. In a recent Declaration, SIWI’s Professor Malin Falkenmark, along with Professor Johan Rockström of Stockholm Resilience Centre and other world-renowned water, environment and resilience scientists and experts, said that better management of rain is key to eradicating hunger and poverty. By 2050, the scientists said, business-as-usual will mean two billion smallholder farmers, key managers and users of rainwater, eking out a living at the mercy of rainfall that is even less reliable than today due to climate change. Setting out to eradicate global poverty and hunger without addressing the productivity of rain is a serious and unacceptable omission. The proposed SDGs cannot be achieved without a strong focus on sustainable management of rainwater for resilient food production in tropical and subtropical drylands, said the scientists. An SDG for water is needed for energy. Will Governments Keep Their Promises on the Human Right to Water? Today, an estimated 1.3 billion people lack access to electricity. Most of them live in Sub-Saharan Africa. Approximately 90 per cent of global power generation is water intensive. To be able to deliver sustainable energy globally, we must manage our water resources more efficiently. We need a water goal for our climate. Climate change over the 21st century is projected to reduce renewable surface water and groundwater resources significantly in most dry, sub-tropical regions. Climate change is also projected to reduce raw water quality and pose risks to drinking water quality, even with conventional treatment. Floods, droughts and windstorms are the most frequently occurring natural disasters and account for almost 90 per cent of the most destructive events since 1990. Wise water management that builds on ecosystem-based approaches is essential for building resilience and combatting adverse impact from climate change. I believe that the adoption of a dedicated SDG for water will help avoid fragmented and incoherent solutions, and contribute to a fairer handling of any competition between different water users. I believe that water also needs to be addressed and integrated into other SDGs, in particular those addressing food security, energy, climate and health. These areas must then be integrated in a water goal. There is an urgent need for reciprocity. We simply cannot afford to disregard water’s centrality in all human activity. 2015 will put the world to the test. Are we willing to commit to and act upon goals and targets that are necessary to accomplish a future for all? This question needs to be answered, not only by politicians and decision makers, but by us all. Water, as we have shown, plays an important role in securing the future we want. And the future we want is a joint effort.